These gluten-free Reuben Quesadillas are great eaten fresh off the griddle, but you can also make them ahead and pack them in a bag for lunchtime. Spread 3 of the tortilla halves with 1/2 teaspoon of mustard. Divide the corned beef in thirds; lay 1 portion on each of 3 halves of the tortilla. Divide the sauerkraut in thirds; lay 1 portion on top of the corned beef on each tortilla. Lay 2 slices of Swiss cheese on top of the sauerkraut on each quesadilla. Cover each quesadilla with the remaining 3 tortilla halves. Cut each tortilla semicircle in half to make a total of 6 halves. Place the quesadillas in a large skillet that has been prewarmed over medium-high heat, and toast the quesadillas on each side until the tortillas are lightly browned and the cheese is melted. 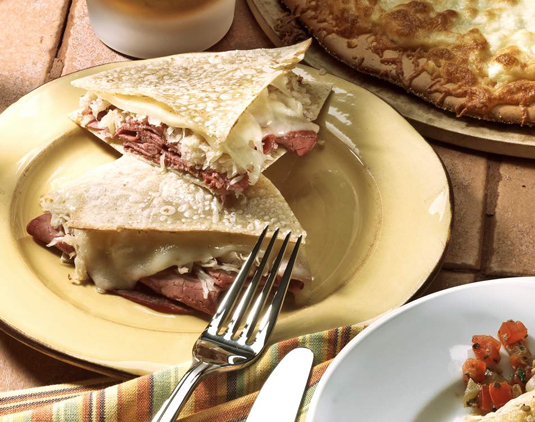 You can substitute different ingredients for the contents of the quesadilla, using pastrami in place of the corned beef and/or provolone cheese in place of Swiss. If you aren’t a fan of sauerkraut, substitute cole slaw. Per serving: Calories: 232; Total fat: 10g; Saturated fat: 3g; Cholesterol: 47mg; Sodium: 7,143mg; Carbohydrates: 16g; Fiber: 1g; Sugar: 1g; Protein: 24g.